Friends came to visit a few days ago and informed us that one of them is allergic to garlic. This presented The Literate Chef with a challenge, as garlic is a staple in our house. 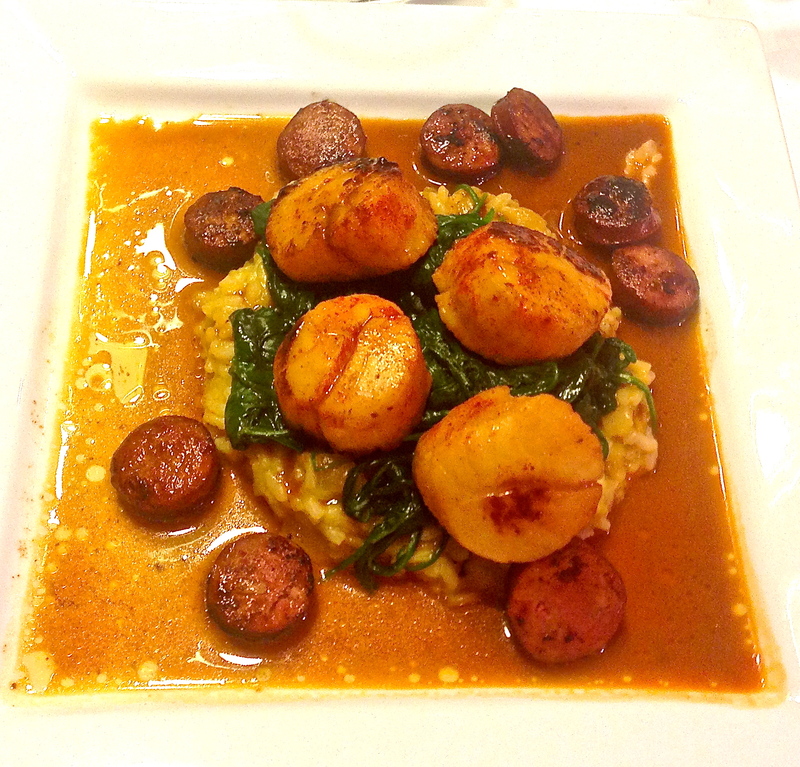 Rising to the occasion, and knowing that seafood and pork marry well, we decided to prepare a one-dish meal of Pan-Seared U-10 Sea Scallops, fried Andouille Sausage, spinach and a simple risotto. For extra flavor, we used smoked paprika, and white wine. The result far exceeded our expectations, everyone enjoyed the meal, and an allergic reaction was avoided. 20 large (U-10) Scallops, about 2.5 lbs. Pre-heat oven to 175 degrees. 1. In a 2 qt. pot, bring the Seafood Stock to a boil. 2. In a 3 qt. pot, melt ½ the butter, add the chopped onion and cook until translucent. 3. Add the rice and stir well. 4. Add 1 cup of hot Seafood Stock to the rice and cook until the liquid is fully absorbed. Add some wine (1/4 cup or so) and when that is absorbed, repeat the process, alternately adding stock and wine (be sure to retain ½ cup of the stock for the gravy) until the risotto is done, about 30 minutes. Keep warm on the stove. 5. Add ½ cup of wine to the ½ cup of retained stock and keep warm on the stove. 6. In the meantime steam the spinach. When done remove to oven to keep warm. 7. In a non-stick sauté pan, brown the sliced Andouille sausage on both sides. When done remove to the oven. 8. Pat dry the scallops with paper toweling and liberally sprinkle one side with the smoked paprika. 9. Heat the remaining butter in the sauté pan, add the scallops, paprika side down, and sprinkle their tops with additional paprika. Pan-sear the scallops 5 minutes (if using smaller scallops, adjust time accordingly) turn the scallops and continue cooking for another 4 minutes. 10. While the scallops are cooking, assemble the other ingredients, preferably in bowls. 11. Divide the risotto evenly in each bowl, follow with the spinach, placing it atop the risotto, and then add the sausage slices around the sides of the bowls. 12. Pour the cup of stock/wine over the scallops and bring to boil for 30 seconds or so. 13. Remove the scallops from the pan and place them atop the spinach. 14. Spoon the sauce equally over each serving.